Melanocytes are cells that produce a pigment called melanin. They are found in many parts of the body where there is pigment, particularly the skin, hair and eyes. In embryonic development melanocytes are related to cells of the nervous system. Melanogenesis (formation of melanin) is a complex process with genetic, hormonal and ultraviolet (UV) control. A suntan is the result of stimulation of these cells by sunlight (UVA and UVB). Inside the eye, melanocytes are found in the iris and choroid layers (a thin layer of cells lying beneath the retina). What are melanocytic eye tumors? Melanocytic tumors are formed by abnormal melanocytes. Melanocytoma is a benign (non-spreading) melanoma. Malignant (spreading) tumors are sometimes called "melanoma" or more specifically "malignant melanoma" or "melanosarcoma". "Eyelid and conjunctival tumors are usually malignant in cats." Eyelid and conjunctival tumors are usually malignant in cats. Limbal tumors (tumors that form at the junction between the cornea and sclera) are benign and can be removed surgically. 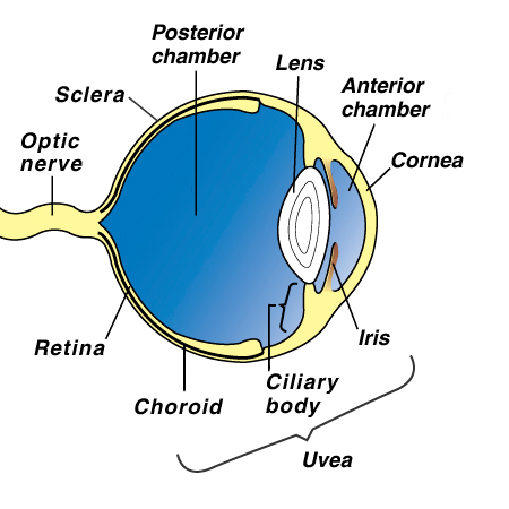 In cats, the most common melanoma of the eye has its origin in the iris (anterior uvea) [see diagram]. They are usually benign but may cause problems by increasing the intra-ocular pressure (glaucoma), which can lead to blindness. In humans, environmental and host factors are important in development of melanoma. In cats, these tumors are most common in heavily pigmented animals. Why has my cat developed this cancer? The genetic make up of your cat and/or heavy pigmentation are probably the main predisposing factors. "Melanomas are the most common intraocular tumors in cats." Melanomas are the most common intraocular tumors in cats. 'Iris diffuse melanoma' is a presentation unique to cats and is the more common type. Conjunctival and limbal tumors are rare. Ocular melanomas occur mostly in older cats. Primary conjunctival tumors may cause redness and weeping from the eye before the lump is visible. This is painful. Limbal tumors are protruding black nodules at the corneoscleral junction. They have a smooth surface. Iris diffuse melanoma causes diffuse thickening of the iris. The cells proliferate over a period of years although the speed of progression is highly variable. The malignant tumor may develop slowly from plaques on the iris and take up to seven years before it causes glaucoma and blindness. At this stage, it needs removal. Early tumors may show no clinical disease at the time of diagnosis. "Clinically, these tumors are usually visible with an ophthalmoscope." Clinically, these tumors are usually visible with an ophthalmoscope. Not all are pigmented and other types of tumors may also be pigmented or look dark. Therefore, accurate diagnosis of the type of tumor relies upon microscopic examination of tissue. Your veterinarian may use one or more methods of obtaining the appropriate tissue samples for diagnostic purposes, including cellular aspirates, biopsies and full excision. Iris tissue can be sampled by the vacuum technique for rapid diagnosis by cytology (the microscopic examination of cell samples). This assesses the need for surgery, after which excised tumors may undergo microscopic examination of tissue (histopathology). Your veterinarian will submit the tissues to a specialized diagnostic laboratory for examination by a veterinary pathologist. Histopathology enables more accurate diagnosis and prediction of behavior (prognosis). The histopathology report indicates the type of tumor and mitotic rate (which is important to predict life expectancy). The pathologist may need to remove (bleach) the pigment to check for malignancy with greater certainty. "In cats, melanocytic tumors arising in different parts of the eye show different behavior and need different treatment." In cats, melanocytic tumors arising in different parts of the eye show different behavior and need different treatment. Conjunctival tumors are usually malignant so full surgical removal is the treatment of choice. Limbal tumors are protruding black nodules at the corneoscleral junction. They have a smooth peripheral growth pattern so can be surgically removed without removing the eye. Most other tumors eventually require more extensive surgery. As in humans, there has been little progress with other treatments. Cancer very rarely disappears without treatment. Very occasionally, spontaneous loss of blood supply to the cancer can make it die but the dead tissue will still need surgical removal. The body's immune system is not effective in causing these tumors to regress. After surgery, an "Elizabethan collar" may be provided to prevent your cat rubbing his or her eye and interfering with the operation site, which must be kept clean and dry. Any loss of stitches or significant swelling or bleeding should be reported to your veterinarian. Specific treatment may include eye drops and ointments with antibiotics and anti-inflammatory drugs. Melanomas arising from the eyelids and conjunctiva are malignant and both may recur or metastasize (spread to the remainder of the body) even if histologically they appear benign. It is difficult to promise complete cure once your cat has developed this type of tumor. The prognosis of diffuse iris melanomas is controversial. It is uncertain whether all iris spots progress or not. The consensus is that, although these tumors are more likely to eventually metastasize than the similar tumor of dogs, this will only occur in about 20 percent of cases. The general recommendation is to watch these tumors for any sudden change in growth habit. Tumor-induced glaucoma (internal fluid build-up causing pressure and resulting in blindness) may occur slowly over several years in the affected eye and may eventually require removal of that eye. Limbal tumors have a smooth surface so can often be cured by surgical excision without removal of the eye.